Feast your ears on these marvellous musicians who know Sarita. There’s contributions from the divine voices of Ravi and Sudha, Japanese master Kohrogi San, the freedom loving Satyaa and Pari and the ever-inspirational Praful and Peru. Ravi and Sudha offer sacred chants and songs from the heart, taking the audience on an exquisite journey through sound, silence, and celebrations of inner peace, inviting listeners to join in both song and silence. Ravi has been performing for more than 20 yeas, including playing for Osho at the White Robe evening meeting. Sudha has been sharing the gift of her angelic voice for the past 10 years across the world. The duo weave influences from the East in the Sufi and Indian traditions to Africa, Brazil and beyond. Their music has been termed as ‘Devotional World Music’. Ravi and Sudha have many lives dates coming up in the next few months, click on the links for more information. Kohrogi San and with his band. From Champaka, Kohrogi Sensei’s interpreter and friend: “Sarita loves Kohrogi Sensei’s meditation group called ‘Natsukashi’ (remembering your original face) and she has attended his Natsukashi and Ito Thermie workshops many times throughout the past 15 years. 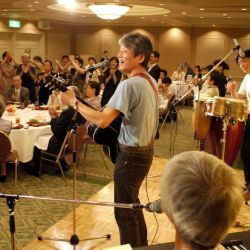 In one of the groups Sarita asked Kohrogi Sensei to compose a song for the Natsukashi group, as he used to be a professional singer in Japan many years before. Sarita’s wish inspired Kohrogi Sensei strongly and through her enthusiasm for his music he felt deeply encouraged to start composing music again. Since then he has been composing many songs and given many concerts mainly in Tokyo and Kyoto with his band called ‘Buddy Time’. His songs are written in poetic lyrics and always carry the essential message to remember our original self inside. The chosen song ‘On the Way’, is reminding the listener to celebrate each moment and to see that life is a constant flux. The path to remember our original self sometimes feels lonely. Like a river is flowing down to the ocean we experience many events on the way. But surely we will reach to the ocean. This song is to encourage us ‘on the way’ to remember our original self. If you are interested in Kohrogi San’s music or in his workshops please email Champaka. 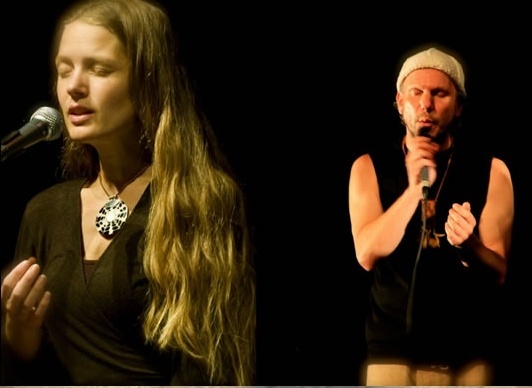 Pari says: “Together with Satyaa we are travelling and offering chant and mantra concerts for the last ten years and I have been running the “Alexis Zorbas Center” on Corfu since 1991. We have been friends with Sarita for many years and this year in June we met in Southern France while we were giving a concert at Trimurti during the spiritual Festival, Festi’ Spirit, near St. Tropez. She came up after the concert to tell us just how much she loved it! Our music is inspired by the love for life, for God, for freedom. We lived for many years with Osho in Pune, India and have been traveling – and still are – sharing his vision of freedom and happiness everywhere. Music is offering one of the most direct accesses to that – directly into the Heart of the present moment. In our music we are chanting many ancient mantras – mantras are in short terms an invitation to meditation and re-discovery of our true inner and permanently unspoiled and ecstatic nature. Mantra in loving embrace with Tantra. We share with you here the title song of our CD” To the One”, maybe the most Tantric and sensuous of our albums.” Listen to it here. Find out more about Satyaa and Pari at their website. Praful says: “I just love Sarita – she has been incredibly supportive and appreciative of my music. Not only does she bring people more playfulness, more joy of living in their bodies and connects them with their being, but she is also always in service of the higher, in service of love – to me, everything she does comes from a place of pure love, and she transmits the divine effortlessly and most naturally just the way Osho did. She always seeks to connect and put together the people around her, to help them grow, shine, expand and live life more fully. I feel blessed to have her as a friend. I first met her in Pune in the Ashram in the 90’s, and then I did not see her for many years. Long after we reconnected, I found a picture with her, Deva Premal and two other friends from Pune taken during some roof top party. Find out more about Praful and Peru.